To create a family using people who already exist in Tithe.ly ChMS, simply go to the ‘Family’ tab within one of the family members. 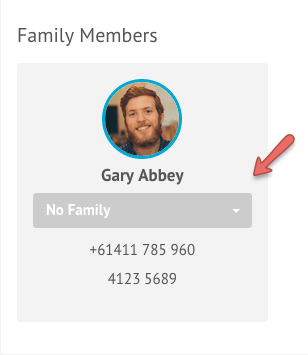 From here, click on the ‘No Family Recorded’ button to assign the person a position in the family (e.g: if you want to add them as a child, you can do it here). You can also search for family members, and by default it will show possible family members for you to choose from. First, select the ‘Find Family Members’ button. Be default it will search for people with the same last name as the original member. You can change this if desired though. Simply select the individual you want, select the ‘Add to Family’ button, and select their relationship. Once added, Gina Abbey will be linked in the same family as Gary Abbey. Any family members of Gina will also be added to the same family as Gary as well and the two families will be merged. Click on the ‘Add Family Member’ button on the top right corner of the page. Once the page loads, enter in the person details similar to adding a new person into Tithe.ly ChMS. 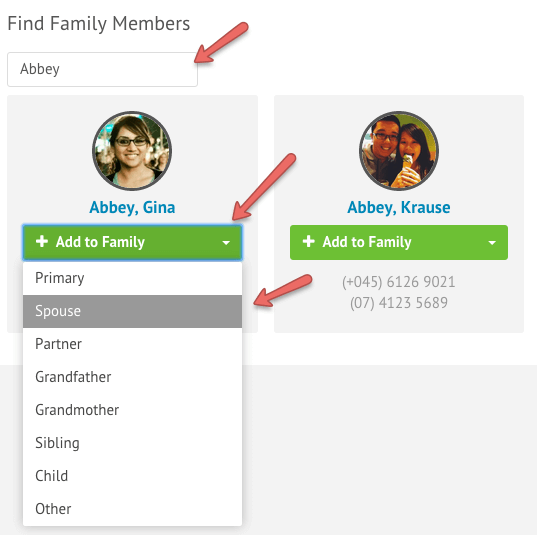 Click ‘Add Person’, and the newly added family member should be automatically linked with the family. To add an entirely new family, from the People page, click ‘Add Family’. 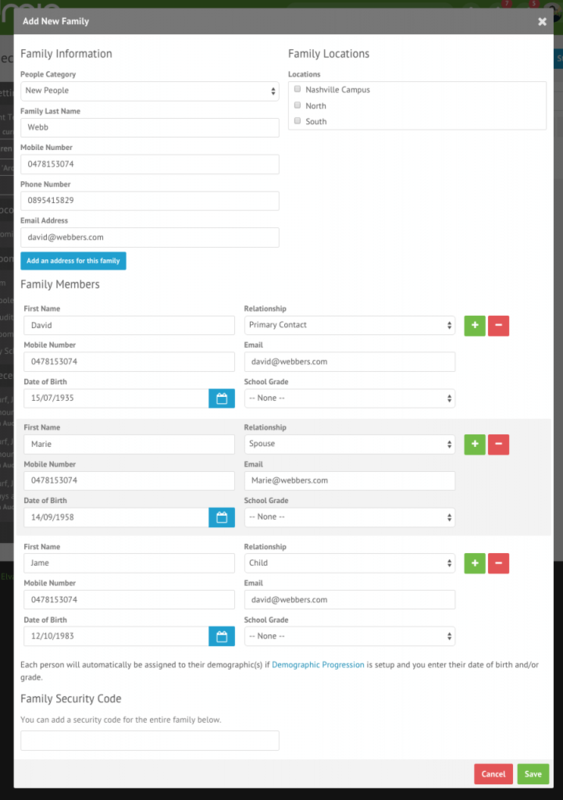 This will take you to a screen where you can enter the last name and basic contact details for the entire family. Once you press the ‘Next’ button, you will then be able to start creating the individual members of the family. Their contact details will by default, be the same as the contact details in the previous screen. The main difference between these screens and the normal ‘Add Person’ screen is the choice for the family relationship at the top of the screen. 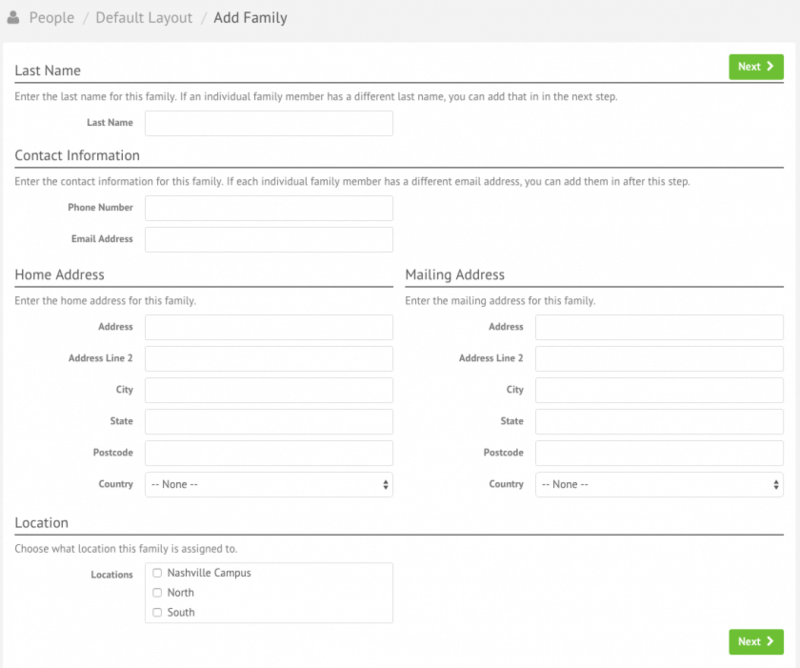 Fill in the data for the individual family members one at a time, and you’re good to go! During check-in, you can create a family for new members that come on the day of a service. This allows you to add new members of your church quickly into the system. To add a new family, from the check-in page select the ‘Add Person or Family’ button. This will bring up a window where you can select to either add a new member to an existing family, or add an entirely new family. Select the ‘New Family’ option. From within the window that pops up, enter the details for the new members all at once.